I have been home for a few days now, starting to settle into my new house and enjoying the company of my Maine family. And what a treat to come home to 70 degree weather in Montana! The last few weeks was some of the toughest and most beautiful of my racing career, for every part I am grateful. The first two weekends, Fontana (read about Fontana below) & Bonelli, my XC race’s were two of the toughest to even finish, as my body struggled to turn over my pedals on the steep sections, and all I felt like I could accomplish was to try to recover where it flattened out. My legs hurt so badly and my mind struggled because I was struggling physically. To finish those races was humbling and difficult, when it seemed like it would be better to DNF than to accept a lackluster performance. The disappointment was difficult to control after how much I invested into being ready for those races and how many people are invested into my racing. I’ve decided that I’m entitled to cry as much as I need to and it’s ok (once back at the hotel that is), as it’s really all part of the process. I am grateful that the pressure that I put on myself comes from within, and everyone else was only encouraging and supportive. It is impossible to pinpoint what caused my body to feel that way, maybe I was more tired than I realized. Following Bonelli XC; a muddy, wet struggle; and what I like about this photo is that it shows exactly the way I felt. Short Track followed each of those races on the next day. Each of my Short Track races went well, and encouragingly my body was able to sustain the efforts. Winning Fontana (below) and taking 6th at Bonelli. The Bonelli Short Track is one of the most tactical races, and our field was deeper than the proceeding ST races. I have a lot to learn about tactical racing and this was a great one to practice on, as positioning is everything with the front group remaining about 10 ladies through most of the race, and finishing times being fractions of seconds. Off the front in short track, blowing myself up for a prime, which Erin won…Not a tactical move at all. After Bonelli, I traveled with Chloe and TJ to Berkley, CA, where we stayed with Chloe’s grandparents and prepared for Sea Otter. I rested a bit more and enjoyed the hilly rides around Berkley. At this point in my trip, I was missing my family a lot, especially Layla, and that tugging on my heartstrings was getting stronger. I knew I had one last shot to get me home on a positive note, so I put my energy into one last attempt for a solid race weekend. We arrived at Sea Otter early Thursday. My Pivot Les 29 (pictured above) was getting launched at the Pivot booth, and I was one of few who had ridden it or raced it prior to the launch. Following the Les launch, we attended the Stan’s NoTubes New MK3 Wheelset launch and 15th year party. These two companies have shown the most incredible support along with incredible product, I couldn’t be more grateful! After sneaking in a pre-ride, Chloe and I got cleaned up for dinner with our KASK family…Nat Ross, Sonya Looney, Courtenay McFadden, and Rebecca Gross. Such a pleasure meeting Sonya for the first time and catching up with the others. Friday morning was short track. I made some adjustments to my pre-race warm-up routine, really made possible by having trainers from Feedback Sports to warm up on, and I liked how my body responded. After loosing positioning at the start, and a congested first lap, I ended up chasing and it ended up being a solid effort, but crossed the line in 11th. Chloe on the other had, took another short track WIN. I have a few things to learn from this tactically savvy racer who I am honored to be teammates with. The Cross Country race Saturday morning ended up being one of the best performances of my career. I rode on the limit of feeling like I was going to explode the entire race, which lasted a short 1 hr 11 min. My system functions were back in full force, the feeling was sweeter than I could have even imagined after the previous struggle. Snatching 5th at Sea Otter will remain an lifetime inspiring highlight to me. I raced just off the lead group the whole race, they were just within reach, but I couldn’t quite bridge the gap that opened at the start. There is no question that I earned my spot on the podium that day, but learning to be self-confident has been a process I continue to struggle with. 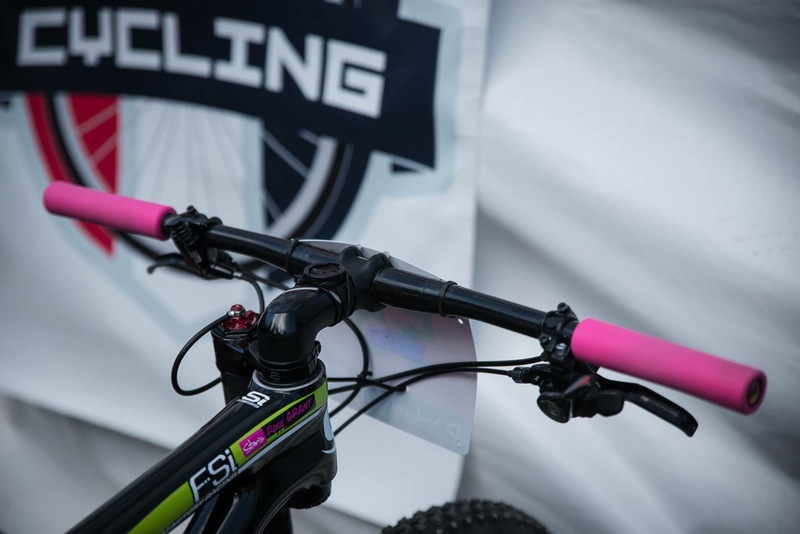 As riders like Erin Huck, Chloe Woodruff, and Ren Chengyuan each had slight issues that set them off pace, I found myself making excuses for my podium because of the issues encountered by these riders. I know that most of us struggle to a degree with having confidence, but I’m learning the importance of having true confidence and the power that comes with that piece. I’m stoked to rock the orange Fox fork on my Les the rest of the season! Reunited with this sweet face. Layla is such a trooper. She handles being separated from me like a champ. It’s not easy for any of us, but this life is all she knows, and we are both empowered by what this life has offered. I am greatly blessed by the support from Nelson, which allows me to be away from home for these extended periods. I’m so thankful to Janet (mom-in-law), who traveled far and took great care of my precious daughter! To Chloe and TJ, who at this point have become more like family, lol! To Team Stan’s NoTubes-Pivot and all who support the journey! I’m often asked how it is possible to be away from home for nearly three weeks of racing in California, as it could seem impossible to do with a family. My particular situation is unique! It really is that my husband supports me in this endeavor, and I have help. My mother-in-law and sister-in-law flew to Montana from Maine to stay at our house during the duration of this block. Preparing to be gone for this race block also backed up almost simultaneously to moving into our new house. I was cleaning a newly constructed home 2 days prior to leaving, and frantically making beds and unpacking essentials the afternoon before. I’m really happy that my home is getting broken in for me by those I dearly love, but it was a little stressful for a few weeks. Cleaning our new house… my husband has worked so hard on this for almost a year. After moving and traveling to California, I was running on empty. Although, I thought I had bounced back sufficiently, and my pre-rides seemed to have put me into a good place, my body struggled during Saturday’s cross country race. Instead of racing other ladies wheel to wheel, the battle was within mentally and physically as the field spread out. Good things can come from not having an ideal race, for it’s in the valleys that we learn and grow the most. Still pulled through in 6th on my Pivot Mach 429 with my Valor wheels. I don’t typically choose to race my dually for XC, but it was definitely my ideal ride of choice for the rough and rocky terrain. After 10 hours of sleep, I woke up Sunday with renewed energy. The support and love from so many who truly believe in me went a long way, and I could feel God’s presence in my heart and my body. From the gun, short track was exciting. I led a few laps, then tried to race smart; staying within the top four with Larissa Connors, Kate Courtney, and Lea Davison; while not allowing any gaps to open up. I was able to save just enough on the last lap to get around Kate on the flat straight-away and Larissa on the last climb just before descending and crossing the line taking the Win. Sunday was a good day for Chloe as well. Although I missed her this weekend, she came home with a Bronze Medal from the Pan American Championships in Argentina! Kenny had a running joke all weekend, calling me “the princess”, which in short means he made sure that my equipment and I were both ready to roll perfectly… Thank you to Kenny and Stan’s NoTubes, and Pivot Cycles, and to those who love and support me in this journey, for He goes before me. Getting to wear this hat on the podium was my carrot from Fox and Kenny to win. I’m staying this week with my host family in San Dimas (Thank you Thrashers) to recover and get excited for the first US Cup at Bonelli Park this weekend. Travels of race season have begun and really won’t stop until mid September. I was gone about a week and a half for this last trip, but to me every opportunity to spend with my team and travel to races with them is a privilege. I am blessed that my husband, Nelson, is willing to hold down the fort at home with Layla while I am gone; he encourages me to continue the journey that began for me now a short 6 years ago. After spending a long weekend in Sedona for a team photo / video shoot, we headed back to Prescott for some rest, riding, and prep for the first race weekend in San Dimas, CA. At this point in the season, I have been training inside primarily and many unknowns loom leading up to the first race. I know that I have done my work to the best of my ability, and I deserve to be confident in that. In addition, Kenny and TJ are so diligent in making sure my equipment is working flawlessly, that I have little to think about other than myself. Sedona was magical in all it’s beauty. The outcome of the first race was confirmation that I have been faithful in doing my part, and God is continuing to bless my efforts. The women’s field offered some strong competitors, that I was unable to pace with until midseason last year. The race effort actually felt good, and although I faded a bit toward the second half of the race, my pace remained strong and I crossed the line in 4th, behind Erin Huck, Chloe Woodruff (my teammate), and Larissa Connors. The best way that I could describe how flawlessly my Les 29 hardtail handled was nothing less than “Dreamy”. I’ve never had my suspension so dialed as I did for this race. Mike (the Fox guru) had my fork responding perfectly; and my Ikon 2.2 tires on my Valor wheels gave me so much added confidence for descending. Making sure I have nothing left as I close out the final lap. Short track follows Saturday’s XC race on Sunday. Chloe and I had some strategic discussion on tactics, and I was looking forward to another strong day for the both of us. Chloe had an awesome race and took the win, while I had a mishap that left me chasing for most of the second half, which ended in a good training day for me…the effort is never waisted. Short track is like a bonus race that doesn’t carry quite the same importance as the XC race; so it’s easier to swallow when faced with misfortune. Congratulations are in order. I’m honored to call this girl my teammate. She is strong and beautiful inside and out. Our set-up at the race is pretty plush. I’m going to get spoiled. Every race gives me new ambitions, motivation, and landmarks. I came home full and ready to keep working harder, loving stronger, and giving greater. My life at home is pretty dang special. With the Stan’s NoTubes-Pivot Team announcement coming out last week, excitement rushes through my body as I think of this upcoming season. With support from the Stan’s NoTubes-Pivot Team, I am confident this will be an amazing year, and I am beyond grateful. Part of me can hardly believe that I, with the help of many, have worked my way up from the very bottom. My first 3 years racing fully self-supported will never allow me to take for granted the support and help of my team and sponsors, which makes me that much more hungry to continue to embrace the work…I love the work. 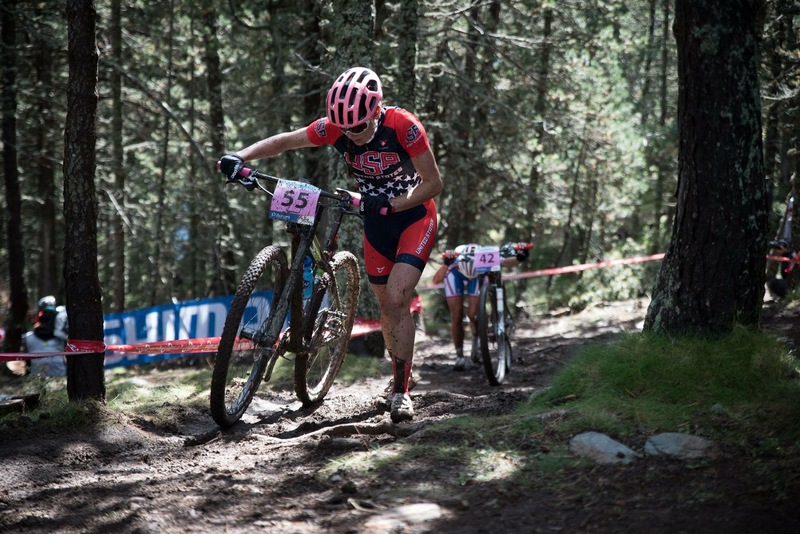 I am so excited to represent Stan’s NoTubes for another year, as well as Pivot Cycles. Chloe Woodruff has been an encouragement to me dating back to my first days of racing with an infant. She has continued to be genuine, humble, and real. I’m stoked to be her teammate! The Stan’s NoTubes-Pivot Team is also sponsored by Shimano (drivetrain, brakes, pedals); Maxxis (tires); Castelli (custom clothing); Clif Bar (nutrition); Fox (suspension); PRO (components); Pearl Izumi (shoes, gloves); Kask (helmets); Feedback Sports (trainers); and Cassette Creative (design, marketing). One month plus 3 days ago today, I was racing my first Mountain Bike World Championships in Andorra; still an experience that feels surreal. My first experience being outside of North America, in conjunction with racing outside of North America was incredible; but what seems equally as incredible is the events leading up to the World Champs. My race season really came together this year, after 4 years filled with tons of work and perseverance, I started to really reap the benefits. It was amazing, being able to put races together with strategy and tactics; I’d replay my coaches words in my head as I played out races the way that we had together visualized. Once the Worlds Team selection had been announced, which I had been waiting for with anticipation, I knew this opportunity was one that I could not possibly turn down due to monetary costs. It had been a goal that I had set for myself back in February, and I had to see it through. My coach assisted me in setting up a couple fundraising campaigns, and the support that I received through those efforts has humbled me, has challenged me to be more generous, and completely brings tears to my eyes! I am incredibly blessed and so grateful! I spent the week in Andorra soaking in the experience, I was the obvious rookie. I was racing with the best in the world, in Europe, representing my country, my team, and my home state of Montana! It was an honor being part of Team USA, and I value the relationships that I garnered with my fellow teammates. As the week unfolded, the rain continued to change the track. Within a few days the course changed from dry and fast, to wet and muddy, to sticky, thick muck. Race day came and the sun shined amidst cool temps. I was number plate 55 out of about 60 racers. I lined up on the back row out of six rows. My plan was to be patient and move forward consistently and tactfully. As the race began, the damage the rain had done to the course quickly became obvious. It was a complete mess. Slower became faster; cornering was slow, climbs became impossible to maintain traction, and the tiniest mistake in bike handling was completely unforgiving. Everyone was off their bikes a lot, running, scrambling, slipping, sliding…. I just kept moving. I’d gain a spot, make a mistake and loose two. Then someone in front of me would make a mistake, and I would gain a spot or two. I continued to slowly move forward. The lap times slowed down so much, that winner Pauline Fernando-Prevot’s finishing time was 1 hr 53 min. By the time I finished in 31st, I had been racing for 2 hr 8 min, about 30 minutes longer than most cross country races. What an incredible race though! My equipment worked flawlessly. In the muddy conditions my Cannondale FSi was the ticket, with my Crankbrothers Eggbeater pedals, and Kenda Karma tires. 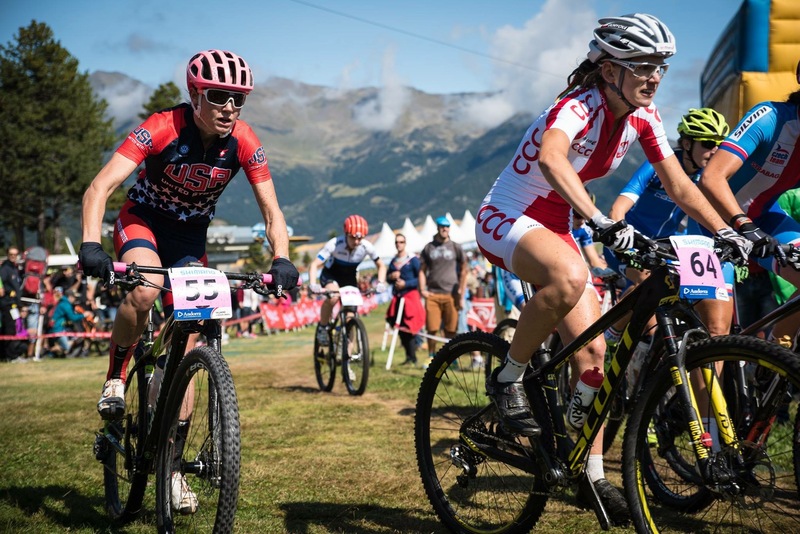 The support from USA Cycling allowed me to really focus on my race. I left everything on the course that day, as I try my best to do on every race day. I had a solid race, 31st for my first world champs is nothing to be disappointed about, and I’m pleased with that result. Deep inside I know I have the ability to do better, and so I continue to stay challenged and hungry, to continue improving and learning and garnering the experience that I need to bridge my way farther up the field. Time and patience is required, but as I approach new bends in the trail, it is my job to explore where they will take me, and continue to trust that God will bless my efforts. I am so thankful to the village who has continued to make racing my bike possible. My husband, Nelson, is so supportive and proud of me. He, grandparents, and a handful of friends have helped with our daughter Layla for my training and racing. My coach, Dustin; my team, the Stans NoTubes Elite Women; countless local businesses in my community, such as the Sportsmen Ski Haus, Able Body Shop, Access Fitness, the Great Northern Brewing Co., Whitefish Mountain Resort, and so many friends and family have all contributed in so many ways. I am eternally grateful! This morning wasn’t the first and it won’t be the last failed attempt for training that becomes out of my control. As I sit here still in my bike shorts, writing out what happened seems to take away some of the frustration as I try to keep the right perspective. 6am Christmas morning, I drag myself out of my cozy bed and pull on my bike shorts and enough clothes to keep me comfortable in my 47 degree garage. I force down a rice cake with almond butter and a banana, fill a water bottle, pull on my boots, and head to the garage for a 6:30-8am ride on the trainer. Layla normally sleeps till 8, and I can still make Christmas breakfast before hubby Nelson catches a few powder turns up on the Big Mountain. No sooner do I start to warm up, and start working out the achy kinks from my already sore muscles, that I get a text from Nelson, who I might add is going into night shift Christmas night, saying that Layla had woke and was crying. My hart sank…. she must have heard me. After a quick text back, the next thing that I knew, my phone fell from the shelf face-down onto the concrete floor. I stop, yep….. shattered. Well, since I was already off my trainer and distracted, I decided that I had better go check on Layla too. A diaper change and bottle later, she is back in bed and quietly falling back asleep. Now should I go back to my trainer for 30 minutes, or just throw in the towel and make coffee. I decided to make coffee. My first natural response, is frustration as I question why I even try sometimes. But it is Christmas after all, and I don’t want my training to mentally ruin my day. This is just one day that my effort didn’t return a good workout. I still have the opportunity to go pull Layla around the golf course on skate skis later, so I’ll just have to make it count then. Broken phone and feeling groggy from an early alarm, I still have so much to be thankful for. Today I am so thankful to celebrate the birth of my Savior with loved ones. Because of this, I know that my dad resides in Heaven, and as much as he is missed this Christmas, I will get to spend eternity with him. So, with that I wish you the Merriest of Christmases and the Happiest of New Years! 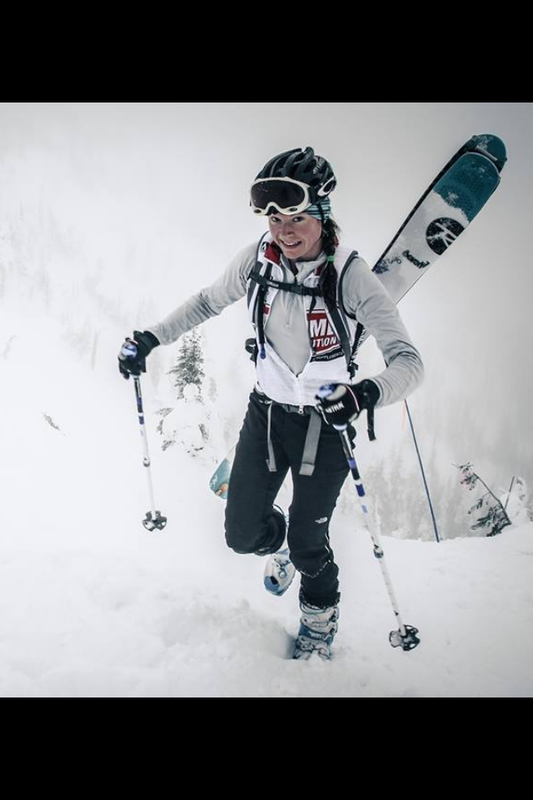 While skinning a lap up Whitefish Mountain Resort recently with good friends Katie French and Megan Couser, a man skiing down stopped and asked us if we were training for something. The first thing that popped into my head was “Yes! The Whitefish Whiteout.” Never before had I done a ski mountaineering race, but with my new backcountry gear, I was inspired to try it. Before I could reply to the man, Katie answered “Life.” There couldn’t have been a better answer! Although races are fun and motivation for training, in the end results don’t matter; it is the big picture that counts! Staying active and healthy and happy and passing that on to your kids is, I believe, one of the best gifts you can give them. Being in the outdoors and enjoying the beautiful earth that the Lord created for us is something not to be taken for granted. Another good friend, Maria, who is normal in the sense she doesn’t have to compete at every sport, asked me why I decided to try ski racing. I knew it certainly wasn’t to win, so why would I sign up to race a sport as a newbie? There are many benefits in competition that do train for life! The people are amazing and inspiring! The Whitefish Whiteout brought all levels of racers. Especially inspiring to me, and hitting close to home was Danni Coffman, 33 weeks prego, and out participating in the fun! She raced the ascent category and straight up killed it! So impressed and happy to see this beautiful pregnant lady staying active. Another inspiring lady was Marg Fedyna, 49 years old and owning it with the win of the women’s AT class, as well as beating some very strong men! Sheli Thomas is another one of my heros. This race was also Sheli’s first ski race at 50 something! She stuck with it and completed the race! Sheli continues to challenge herself with crazier races all the time. It was just a great time to meet some new gals, and catch up with old friends. Another reason that I decided to try ski racing was the challenge, of learning to race a different sport, and cross training with motivation. It is true that results don’t matter, but in the end I’m competitive at heart, and I at least wanted to keep some of the other gals working for it. 🙂 But with that said, I was truly able to enjoy the event without being nervous or pressured with expectations. I got a great 2 hour race effort out of the deal and it was a blast! Whether racing an event just for the accomplishment of finishing, or trying to qualify for a more prestigious event, or wining a world cup; there is self-reward in pushing yourself to levels that would not otherwise be attained without the pressure of a race. Racing teaches a person a lot about themselves. I encourage that all you ladies try some sort of race. Set attainable goals, put yourself out there, get fit, and have fun! Just remember that in the end you are training for life!